Professional chefs have long used sous vide cooking in their restaurants because of how easy to get perfectly cooked food this way. But what about home cooks who want to try it? Fortunately, we now have appliances that can help you do this at home. Our best sous vide cooker reviews will help you choose the best for your family’s needs so that you can turn out delicious and nutritious dishes often. Traditional methods of oven cooking or frying means you have to remove the food at the exact right time or you’ll get either overcooked or undercooked food. Cooking in water is safer because it is near impossible to overcook something. However, directly immersing food in water means that flavor leeches out into the water. The sous vide method of cooking uses water cooking but with the food sealed in water tight and even airtight packets. The water is maintained at a low temperature for a long time, usually for hours, to get the food cooked perfectly. This is a great way to cook tough and inexpensive cuts of meat because slow and low cooking is best for tenderizing. Because the food never comes in contact with the water, all the nutrients and natural juices are retained. The packets of food can be left in the water bath until you’re ready to use them because they cannot overcook. You can even take them out and put them directly into the freezer for future meals. There are two types of gadgets that will do the cooking for you. One is a water oven that holds water at the desired temperature for the set amount of time and you immerse the packets in and close the lid to let it do its job. The other is an immersion type circulator that you immerse and hold in any water bath and it will heat and regulate the water temperature to allow the food to cook. As with all Sous Vide cooking, you’ll need water tight plastic pouches and a vacuum sealer for best results, although you can just use sealed Ziploc plastic bags that are water tight. If you are concerned about BPA chemicals leaching from the plastic bags, find the types that are food safe, and you won’t have any problems. You can find more sous vide cookers here, or you can read on to see which are the top rated ones available today. Cooking with heated water has been taken to a new level with either the big Sous Vide Supreme Water Oven, or the more compact, Sous Vide Supreme Demi Water Oven. Each of them cooks in a completely different way than you may be used to, but the results are outstanding! Once sealed, immerse the filled pouches of food into the heated water, close the lid and let the machine do all of the work. That’s it. Both of these cookers will maintain the correct temperature you have set for hours and days, if need be, and both come with a digital readout that shows time and temperature. They each come with soft touch setting buttons so you can precisely set cooking time and the temperature (1 degree Fahrenheit precision between 86°F and 210°F) you want to cook at. The water circulation is done by convection. There is a light so you’ll know they are heating up, and both a start and stop button, among other helpful indicators. The main differences between the two are their size. The Supreme holds 11.2 quarts of water while the Demi holds 8.7 liters. That equates to the Supreme being able to accommodate up to 20 four-ounce pouches of food as opposed to the Demi being only able to accommodate 12 four-ounce portions. Needless to say, for larger families when you are cooking a full meal, the Supreme is the way to go, while smaller families or couples could easily get by with the smaller Demi model. The Supreme is made of stainless steel inside and out, while the Demi has a coated steel exterior, which comes in two colors, red and black, a polished aluminum lid and an anodized aluminum interior. Both of them come with a mesh rack for the bottom to prevent the pouches from touching the bottom, and a metal tray that holds all the pouches. The other major difference is that the Supreme model comes with an insulating pad for the cover while the Demi does not. This essentially means that the Supreme is a bit more efficient at keeping the heat in during cooking or holding temperature, although with or without the pad, they both do a credible job at holding a precise temperature effectively. So the choice becomes yours, because either size will give you wonderful meals. 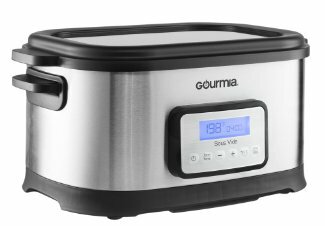 The 9 quart Gourmia GSV550 Sous Vide Water Oven is one of the most inexpensive ways to have sous vide meals in your house or home. With a soft touch keypad and a digital readout screen, you’ll be able to precisely select the temperature needed and the time required for perfect sous vide meals. It will hold the temperature for up to 72 hours at a time, so you can make several meals over many hours, or slow cook meat that literally falls off the bone after that length of time. You can regulate the temperature between 113°F and 194°F and you’ll get an audible alert to let you know when cooking time is up. It features a stainless steel exterior and a non-stick interior, with a stainless cover that doubles as a drip tray or a serving platter. There is room for 12 four-ounce pouches of food, which is plenty for a smaller family or a couple. As a reminder – there is no water circulation pump in this model, it circulates water by convection. Since the heating element is on the bottom, you must use the included rack to place your pouches on because if placed directly onto the heating element, your food may over cook. If you want to get into sous vide cooking, but would rather use your own pots instead, the Anova Culinary Precision Cooker is the tool for you. The Anova quickly attaches to the side of virtually any pot and it is Bluetooth capable, which means you can use your smartphone as the remote control. Set the temperature and timer on the Anova stick, clip it to the side of your pot, and it will first preheat and then circulate the temperature controlled water all around your bags of food until they are done. Since cooking any amount of food sous vide this way is completely dependent on your pot size, you can cook for two or cook for a party or family get together. As long as there is a minimum of 3 inches of water covering the Anova, you’ll be good to go. You can manually set the time and temperature or do it via the smartphone app, and the digital read out, sitting directly on top, is easy to see. The app can also alert you when preheating and cooking is done. The stainless steel bottom cover is removable for cleaning, and the read out is water proof. The newest of the sous vide cookers is the Sansaire Sous Vide Immersion Circulator. It is not inexpensive, as far as immersion cookers go, but it is as good as any dedicated sous vide cooking water oven. The Sansaire is made with a large and wide base for maximum circulation. The large clip allows you to clip it to the side of virtually any pot, and it will circulate as long as there are 2.75 inches of water covering the bottom of the unit. You choose the size of the pot you want and how many people you’ll be serving. The side read out and touch controls are easy to use and see, and temperature remains precise throughout the entire cooking period.